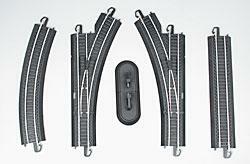 This E-Z Track Expander Set Includes 12 Pieces of HO Scale Snap-Fit Steel Alloy Track with Black Roadbed, from Bachmann. Retail $95.00 SAVE 37% ! overall an excellent buy. used the switch(s) to make a side track where the train will be parked when not in service. the track pieces fit together with ease, when utilizing the switch(s) the train proceeded through without issue in forward and reverse. no negatives to mention no other info was needed to have been known before purchasing. item contents was described as delivered. Snap-fit for quick and easy assembly in minutes. Steel alloy rails and black roadbed. Wood grain detailed black plastic ties. Track snaps together, stays together on floors, tables and carpets. Add this expander set to a standard 36" x 45" oval of track, or use your imagination to create larger fun and exciting layouts. No nails, screws, or special tools needed.